Blepharoplasty, commonly called eyelid surgery, can address puffiness, skin laxity, and heaviness in the upper and lower eyelids. If you’re considering this procedure to achieve a more youthful, refreshed, and awake look, one of the questions you may have about the operation is, “How much does it cost?” Dr. Eugenie Brunner, our board certified facial plastic surgeon, has provided a general overview of the fees associated with eyelid surgery to help you determine if this approach may be right for you. It’s important to note that the price will reflect your unique treatment plan, and Dr. Brunner will detail all fees involved with your operation during your initial consultation. In some minor eyelid operations, local anesthetic may be enough to complete the treatment. In many cases, IV or general anesthesia will be used, which will increase the total cost. Your safety, comfort, and successful results are Dr. Brunner’s primary concerns, and she will recommend the approach she feels can offer the optimal experience. If your vision is obstructed by your eyelids, your insurance may cover a portion of the surgery. Dr. Brunner can discuss whether this may be an option for you. In most cases, this procedure will be considered elective, and you will be responsible for the full payment. For your convenience, we accept cash, checks, and major credit cards. If you would like to consider financing options, we also work with CareCredit™, a reputable lending institution specializing in healthcare loans. The company offers a wide range of affordable monthly payment plans for qualified applicants. It’s natural to have a lot of questions about the price of a cosmetic procedure. 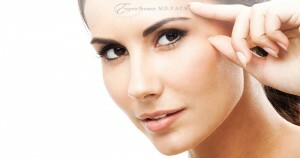 If you would like to know more about blepharoplasty costs, contact us today. We can schedule a consultation with Dr. Brunner and answer any questions you may have.